It is too soon that we must again announce the passing of a dear friend. 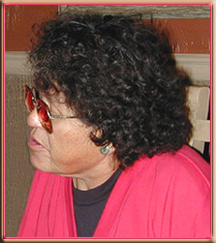 Alice, widow of Bernard Dawahoya, passed away the morning of April 17, 2011. We send our best thoughts to Bernard's and Alice's family. It is with great sadness that we must announce the passing of our dear friend and Master Silversmith, Bernard Dawahoya. Bernard died on February 18, 2010, after a struggle with several eye surgeries, strokes, and diabetes. 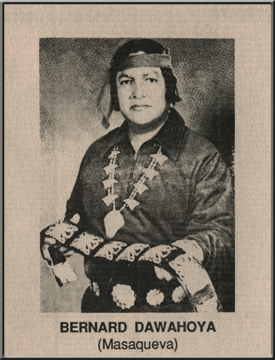 Bernard, or Masaqueva (his Hopi name which means Wings of the Sun), was born in the Second Mesa village of Shungopavi, was a member of the Snow Clan, and a village leader. 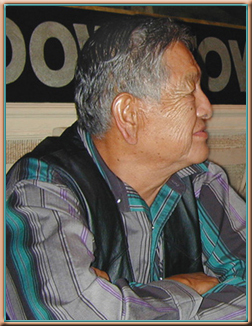 He was a man of many talents and was skilled in many of the traditional Hopi crafts but focused primarily on silversmithing since a teenager. Bernard had long been recognized as a master silversmith and his work is easily recognized by his unique, bold and crisp designs, the heavy weight silver he used, and the precise matting (texturing) he tooled into the negative areas of his pieces. He developed the design elements he used on his jewelry over the years; they are symbolic of Hopi beliefs, history, and culture. Bernard was a wonderful story teller and there was nothing more enjoyable and intriguing than listening to him explain the stories behind his designs. Many examples of his work can be viewed in museums from California to New York and can also be seen in numerous publications. Bernard stamped each piece he made with his hallmark, a Snow Cloud, as shown here larger than actual size. 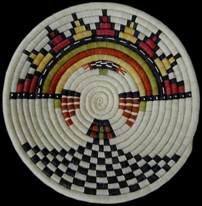 Alice displayed her artistic sense and creative abilities in the extraordinary coiled baskets she crafted. Pictured here is an example of a finely made, eleven inch in diameter, plaque showing the Pahlik Mana, the Butterfly Maiden. 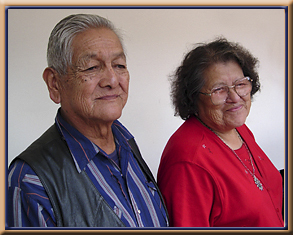 Alice and Bernard have put their hearts into what they do and have often expressed to people who have purchased their jewelry, "may you treasure and wear them in good health". Please join with us in celebrating Bernard's and Alice's lives and in sending our best thoughts and good wishes to their two daughters, Berna and Carol, and to their granddaughter, three grandsons and great-grandson.